2 youth refuse to take awards from Gammanpila's and Duminda's hands at National Youth Festival! 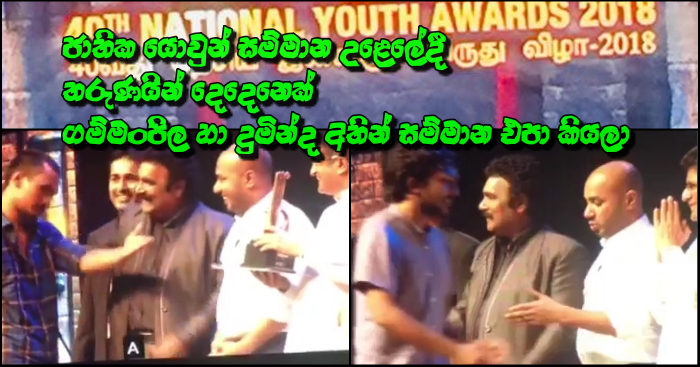 Two invitee Ministers who came to bestow awards at 40th National Youth Award festival at Nelum Pokuna Theatre yesterday (28) had to face a terrible scene. to present the awards. On that occasion it a group who had to get the award for an aesthetic item. But what was most surprising was that the 2 young men who stepped on stage to receive the awards refused shaking hands with the 2 Ministers as well as refuse claiming the awards given by the hands of the 2 Ministers. Later it was seen that they received the awards from the hand of artiste Shriyantha Mendis who was there. It was an instance of sheer embarassment for the two of them who were on stage because of being refused to take the awards at the moment when the Ministers stretched out their hands and hand over the awards which was like a slap on their face. This Youth Services Council together with Ministry of Buddha Sasana and Religious Affairs have combined in this instance and organised this award ceremony. The relevant part of the said incident is by now circulating in the social network.